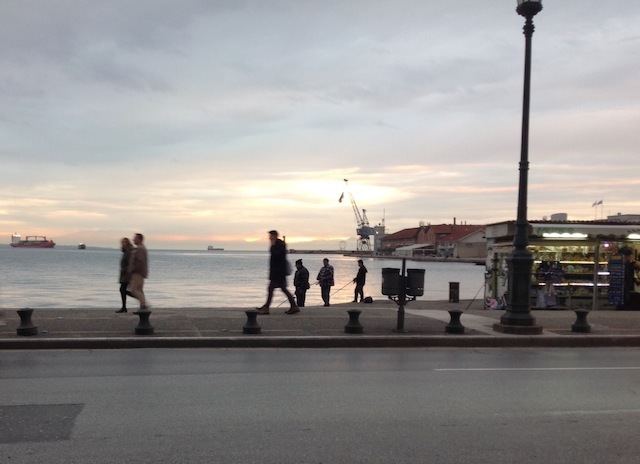 In late November, I spent three days in Thessaloniki, having booked in at the Superior One Boutique Hotel. The Hotel is very modern (compared to its surroundings), has very spacious rooms and bathrooms, and is in a great location. Being the Black Friday weekend, it was a busy time of year. If you are sensitive to noise, then ask for a room not facing the street. I myself had no problems, but traffic was definitely noisy. I took this photo from one of the two balconies of my room. 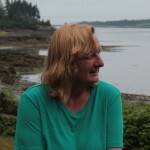 We had arrived in the late afternoon, and walked to the sea shore to see the sun setting. 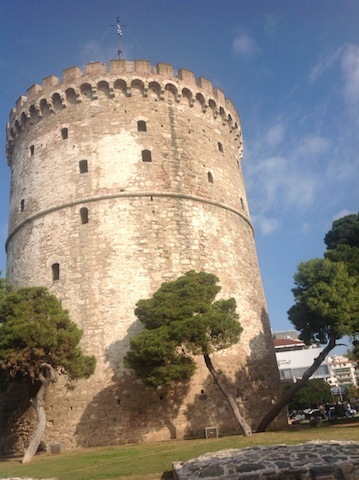 It was a fairly short walk (1.6km) from the hotel to the White Tower. When you get there, be prepared to get hassled by mobile phone and perfume vendors scouring for easy-to-spot tourists. In late November, they still offer some short boat trips from the White Tower towards the sea port and back again. The boat tickets are € 3, and a beverage service is also offered on board. 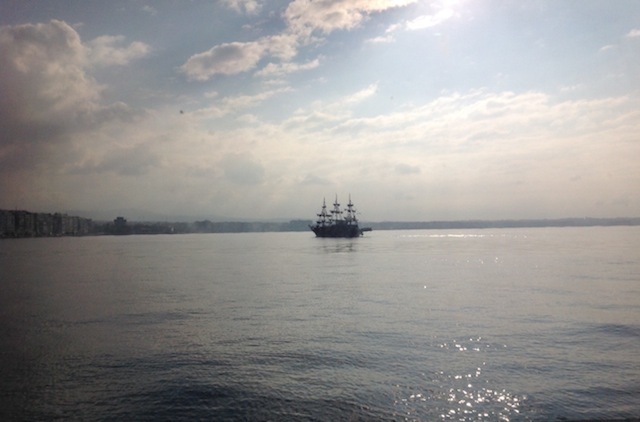 The photo actually shows a sail boat on tour, which we only watched from a seaside café. Most places had out-door heaters running in the evening (daytime temp was around 15°C) for the many people who still want to eat outside. 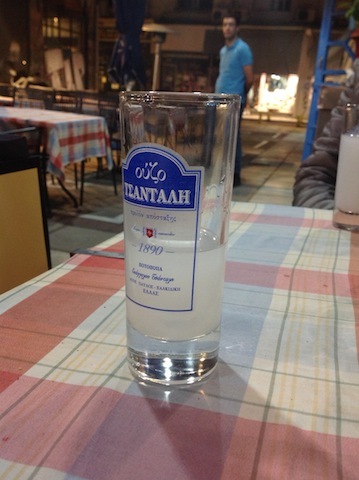 Most traditional taverns, which serve the best local food, are located – as usual – in the little side streets. 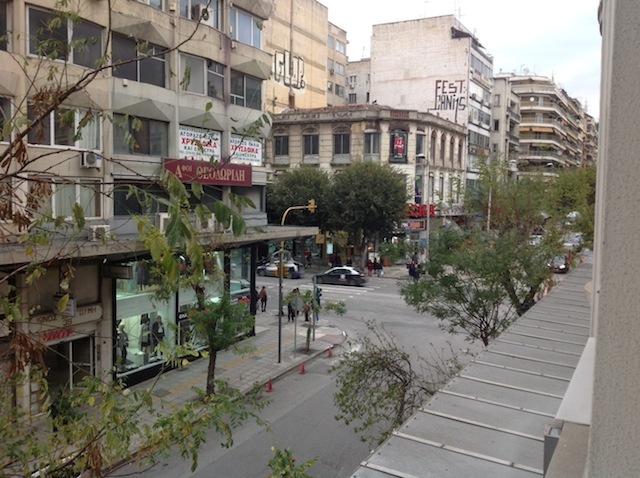 Around the Aristotelous Square, you find mostly cafés, fusion food restaurants, and many stores. 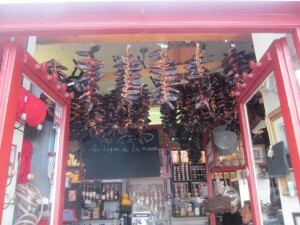 On the last evening of our three-day stay in Riquewihr, we had dinner at the Au Tire Bouchon restaurant. 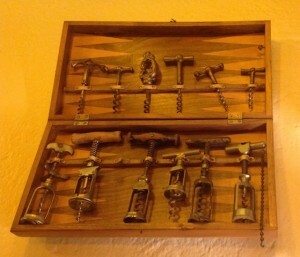 True to its namesake, it had an innovative display of old cork screws on the wall, mounted to an old Badminton board. And yes, dinner and service were good. 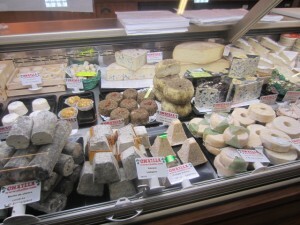 On the way back to Germany, we stopped in the French town of Wintzenheim at the Simply Market supermarket. 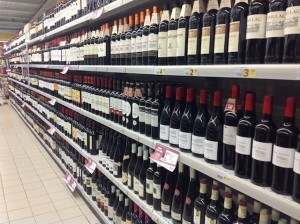 I loved the aisles (yes, aisles) of red wine on display. As we were passing the produce section, a blast of steam came out right from the shelving unit. 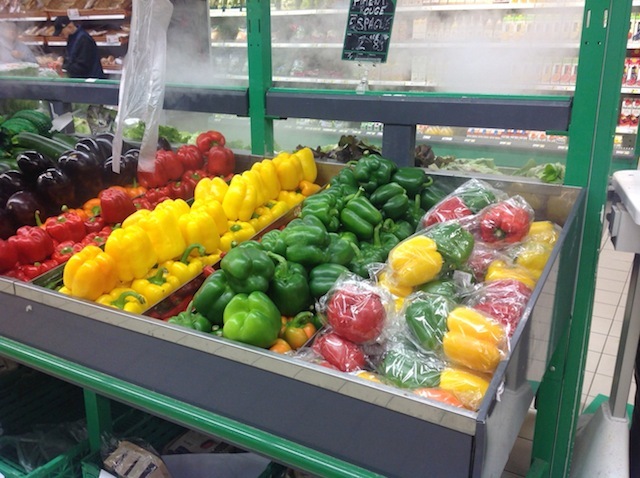 I’d suppose this is to keep the produce fresh and moist. 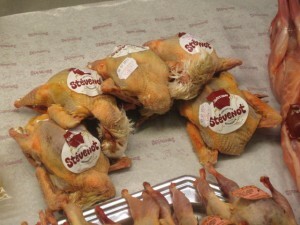 I’ve never seen this in a German supermarket. 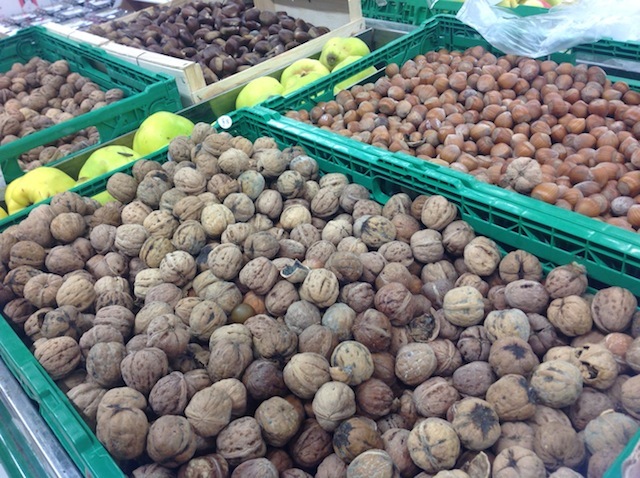 My daughter likes to eat walnuts, but all we get at our very big supermarket in Oberursel is prepackaged ones. I was surprised to see so many nuts for sale. 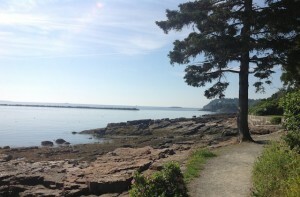 After an almost six-hour drive from Boston, we arrived in Bar Harbor. Again, it was very hot and humid, unlike any weather I had expected from northern Maine. By the time we arrived, I was actually hoping for some fog. We arrived rather late in the day and headed straight to a restaurant on the wharf. 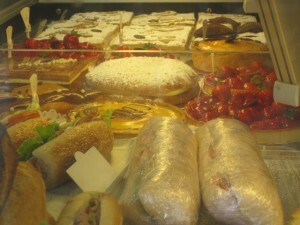 Again, the biggest selection was deep-fried food. No further comment on that. By that time, even our kids rolled their eyes. I had the usual clam chowder and ended up once more eating everyone’s cole slaw, which none of them like anyway. 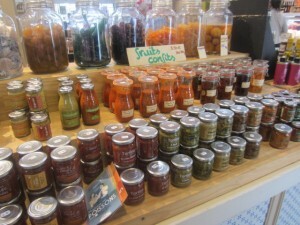 Bar Harbor is a good town for people who like to shop and eat out. There are plenty of shops and restaurants. I prefer quieter places such as the one below. We took an early morning stroll around the shore. This town has a very nice path around the shore lines for joggers and simple walkers like us. I did admire the joggers in the early morning humidity. But that’s all I did. Before heading out to Acadia National Park, we stopped at the Lighthouse Inn and Restaurant in Seal Harbor (only 10 minutes from Bar Harbor) for lunch. 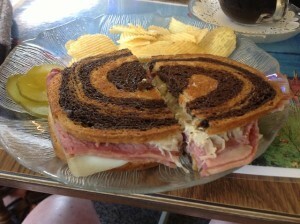 Here I was fortunate enough to find the Reuben Sandwich on the menu once more. Wish I could say, my food orders rotated between seafood chowder and Reuben sandwiches, but this was not the case. Reuben sandwiches were hard to find. For the readers unfamiliar with this type of sandwich: This is corned beef on a bed of sauerkraut with melted cheese and 1000-Island dressing. 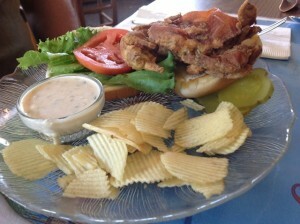 My travel companions ordered soft shell crab sandwiches and seemed pleased. 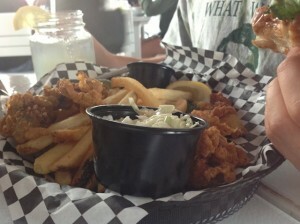 After this wonderful lunch, we went to Acadia National Park, the oldest national park west of the Mississippi. More on that in my next post. For some readers, who are not familiar with our German shopping laws, this might seem unusual. Things have eased up a bit over the years, giving individual states the choice of whether to have shops open and running or not. Before this adjustment was made all shops had to close on Sundays (except for open markets and fairs). Our state of Hesse just announced the dates for the four (limited!) Sundays for Sunday shopping. An unusual concept for many Germans, and the shops are usually full on those days. The German term is Verkaufsoffene Sonntage (no proper translation is available at this point). This new trend of keeping shops open on certain Sundays has been labeled a positive move by our economic experts. Long overdue, but all in good German time. 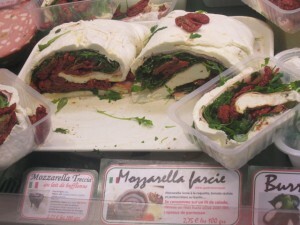 Biarritz, a French vacation resort on the Atlantic coast, is a busy little town. There are so many people out and about to do their shopping on Sunday morning. Germany, in comparison, looks like a ghost town around this time of day. 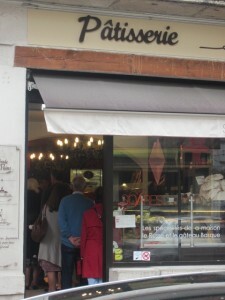 In France, all centre ville shops and markets are open until 13:00. 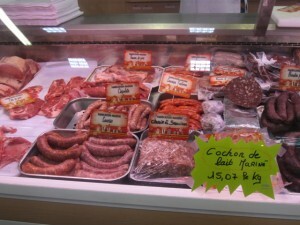 I had almost forgotten how much fun shopping in France can be, in every sense of the way. 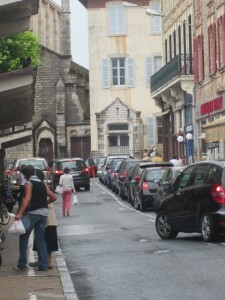 Most shopping is done on foot and beware of parking difficulties when coming to Biarritz. Hard to find a spot and when you do, use your feet around town.